It’s in our DNA to both want simplicity, yet to also create complexity. We are successful because of an ingrained desire to: Advance, Adapt, Create, Control, Improve, Progress, Secure and Survive. We cannot resist changing things, even if ‘progress’ actually makes things more complex. That’s at the individual level. There’s a significant multiplier effect when you consider different people with different motivations inside any organisation. It’s not hard to see how organisations become inherently complex systems. In order to sustainably simplify an organisation, we need to go beyond just fixing or reducing the obvious. This makes a difference but will only get us so far. If we want lasting change, we need to change culture. And as we know, easy that is not. To make the first steps that little bit easier, we’ve designed a guiding set of Simplicity Mindsets, Behaviours and Habits. Individuals who adopt these will play their part in beginning to create a culture where simplicity can triumph complexity. Clarity: The ability to provide well-defined direction and explain (sometimes complex) ideas in a way that can be easily understood by the majority of people. Collaboration: The willingness to work constructively and openly with other people to achieve shared goals. Courage: The bravery to challenge harmful complexity wherever it exists and stopping activities that do not create high-value. Ask: What could be simpler? Ask: How could this be simpler? 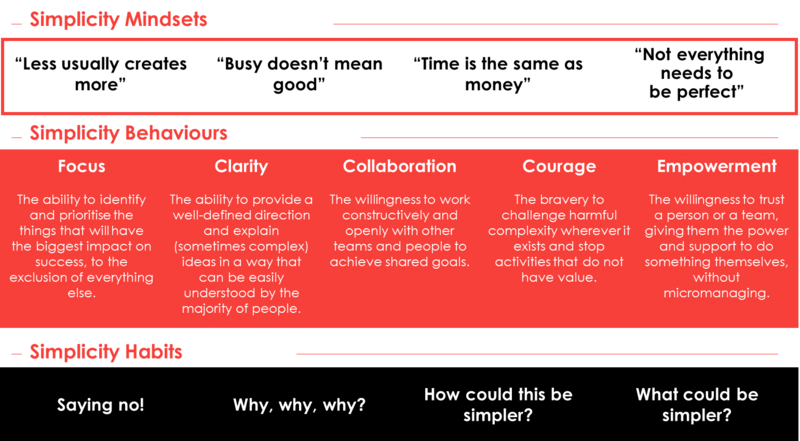 Takeaway: Sustainably transforming organisations from complex to simple is hard. It requires reversing cultural norms which have built up over time. However, there are a starter set of Mindsets, Behaviours and Habits which individuals can adopt. Individual by individual and team by team this can start a movement where simplicity, and not complexity, becomes the prominent way of working.